Strawberry season has finally arrived! I'm probably not the only person obsessed with strawberries. I love going to the market and seeing the first German strawberries laying there, just waiting for me to bring the home and turn them into something even more beautiful (if that's even possible). My kind of beauty: cake in all shapes and sizes. I feel like these days you can buy strawberries whenever you feel like it; all you need to do is stop by your local supermarket. However, I don't really like eatig fruit that has been flown all over the planet just so I don't have to wait until summer to eat it. I think, the waiting is part of what makes summer fruit so precious and special. 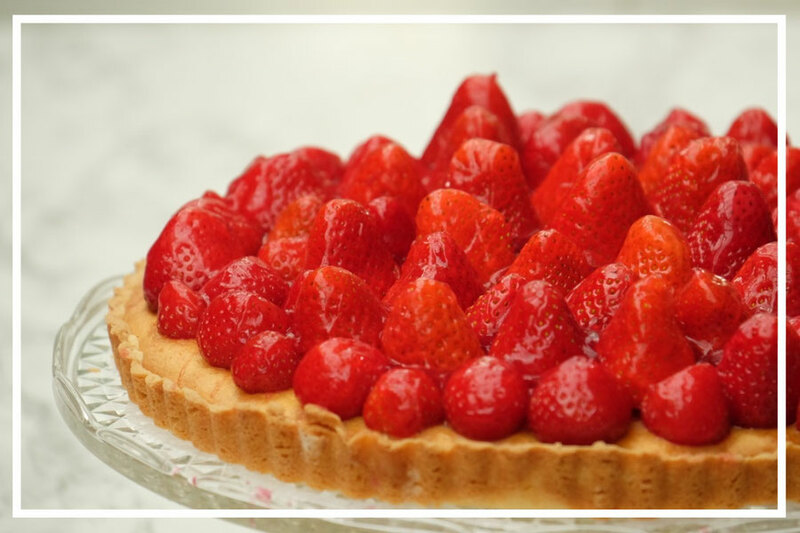 We have three kinds of strawberry cake that we make alot during strawberry season, one of those is this strawberry macaroon cake. 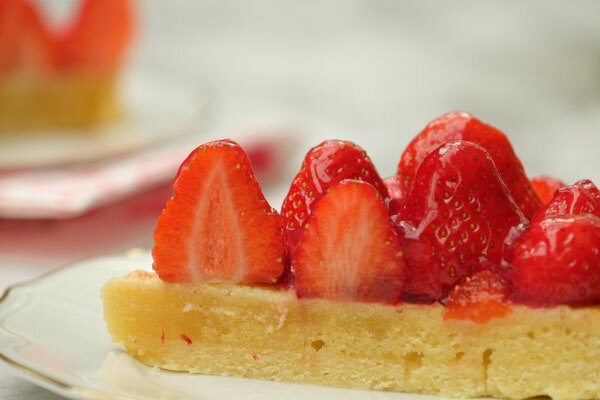 The combination of strawberries and marzipan might seem odd at first, but trust me, they make a superb team. Another plus of this cake is that the base is so easy to prepare and can be made the day before serving. You don't even have to use the glaze if you don't want to, it just keeps the strawberries looking fresh for longer. I hope you guys have a lovely summer, full of berries, cake and friends. To make the shortcrust, cream together the butter and the sugar. Add the egg yolk, the salt and the flour and mix the dough well until it sticks together and forms a ball. Wrap the dough in plastic wrap and refrigerate for at least 1 h to overnight. Butter and flour the springform pan. Unwrap the dough and roll it out between two sheets of plastic wrap, about 0.5 cm thick. Use the plastic wrap to move the dough into the pan. Make sure the dough forms an edge of about 1-2 cm and use a fork to prick the dough on the bottom of the pan. This prevents uneven rising and bubbles in the crust. For the mcaroon part, cream together all the ingredients using an electric mixer. If there are any big marzipan clumbs, use a spatula to break them down. A few small lumps in the batter are okay. Distribute the macaroon batter evenly on top of the shortcrust and bake it in the preheated oven for about 25 min. After baking, the macaroon part as well as the crust should be lightly golden brown. Take the cake out of the oven and let it cool completely. Take it out of the springform pan. At this point you can refrigerate the base overnight. Wash the berries and remove the stem as well as any dents or ugly parts. Distribute the strawberries on the cake in any way you like - I always that in the middle of the cake and worjk my way outwards. Prepare the glaze to the instructions on the package and spread it on the strawberries. It is giving so many tips on strawberry macaroon cake article. Everything you should follow for having new features and reviews. Then everything will be good for all of us, and thanks for everything.